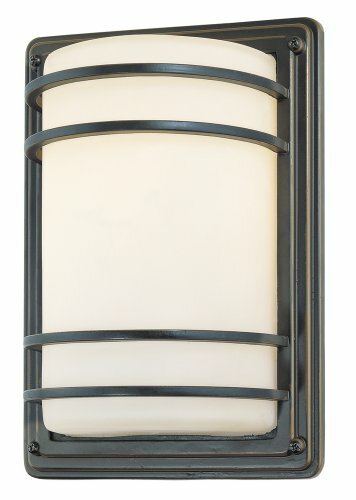 This contemporary outdoor wall light offers a modern style statement for your home. From the John Timberland family of lighting, the design has a clean, industrial look that shines when used on a patio wall. It can also be installed indoors to illuminate hallways and more. It comes in a rubbed bronze finish and has an opal glass shade. - 11" high x 7 1/2" wide. Extends 4 1/2" from the wall. Weighs 3.43 lbs. - Takes one maximum 60 watt standard base bulb (incandescent, LED, or CFL). Bulb not included. - Indoor-outdoor wall light from the Habitat collection by John Timberland. - Rubbed bronze finish. Opal glass. - Wet location outdoor rated. Can also be used indoors. Can be installed horizontally or vertically. Indoor-outdoor wall light from the Habitat collection by John Timberland. Rubbed bronze finish. Opal glass.